1. Blend ingredients together with blender, food processor, magic bullet, or hand mixer, add coconut milk. 2. Make sure to add coconut milk slowly and keep mixture stiff. 3. 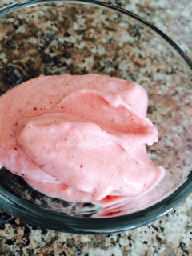 Serve immediately for soft serve ice cream or freeze for 3 hours. Enjoy!